On January 12, 1998, I discovered my mother had died in the night of heart failure. This story is for her, on the anniversary of her death. It was originally published in Homemaker’s Magazine. 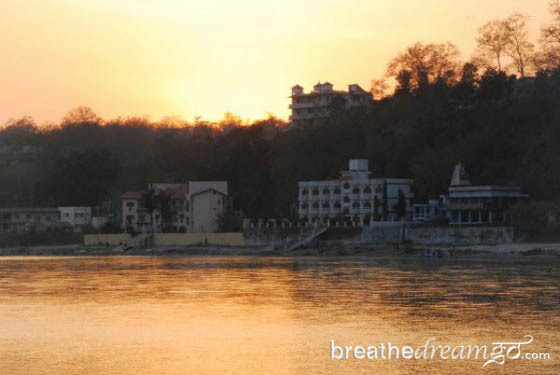 AT DUSK, THE lilting waters of the jewel-green Ganges River take on a more hushed tone as they flow through the holy city of Rishikesh in northern India. 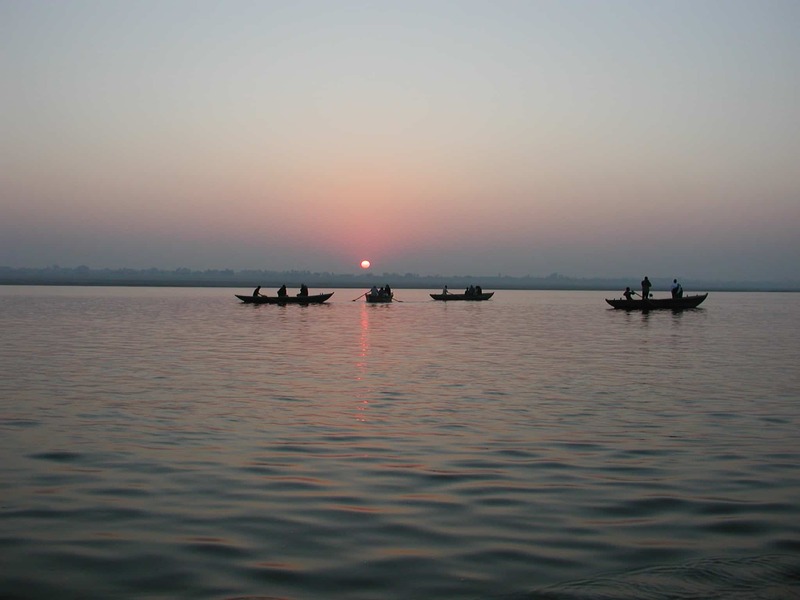 Hindus lovingly refer to this sacred river as Ganga Mata-ji, the mother river. 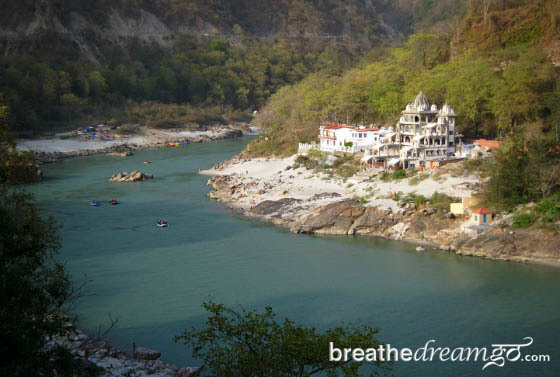 Ganga meets Rishikesh shortly after tumbling out of the high Himalayas, and then flows through a peaceful valley that has been luring sages since before recorded time. I went in the spring of 2006, to be and to heal. As darkness descended one evening, I joined pilgrims, yoga students, tourists and town residents making their way to the aarti (a ceremony to honour the sacred river), held each evening on the banks of the Ganga under an enormous white statue of the Hindu god Shiva seated blissfully in lotus pose. After taking off my shoes (a necessity for any sacred Hindu ritual) I decided to dive into the crowd gathering on the platform at the river’s edge – though I noticed the other foreigners were standing way up on the ghats (steps), away from the action. 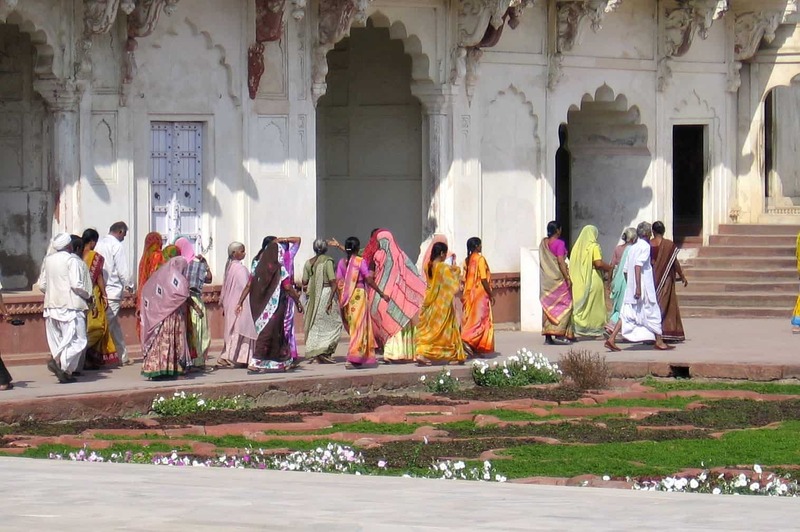 Immediately, a family of Indian women surrounded me. Three generations of smiling women encouraged me to chant, clap and sway along to the uplifting rhythms of the devotional music. They paid as much attention to me as they did to the aarti, making sure that I felt included and knew what to do to follow along with the unfolding ritual. Towards the end of the ceremony, the women encouraged me to buy a diya – a little boat made of leaves and filled with flowers, incense and a candle that signifies divine energy, the light of spiritual truth and the imperishable nature of the soul. 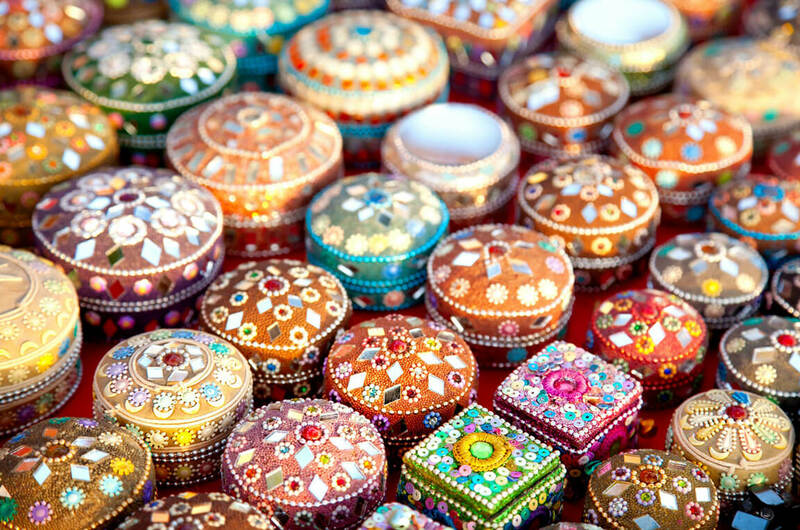 While the festival atmosphere swirled around me, I imbued my diya with hope for personal transformation. I had come to India because a river of loss had run through my life, and I had struggled with grief, despair and depression for eight years. I felt I was clinging to the bank, but the effort was wearing me out. 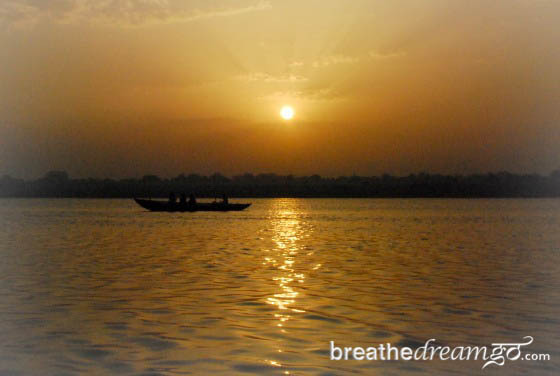 Deciding to leave my life and go to India was like letting go of the bank and going with the flow of the river. I had no idea where it would lead me, what I would learn or how I would change. I only knew that it was going to be big. Eight years before, on a crisp cold January morning in Toronto, I drove with my sister, Victoria, and her husband, Gary, to my mother’s small apartment. Mother had been bedridden for a week with a terrible chest cold, but did not want to see a doctor. When we reached her building, Gary went to get a wheelchair while Victoria and I went upstairs. I knew the minute I opened the unlocked door that something was terribly wrong. I couldn’t feel my mother’s presence. I held out my arms in a spontaneous gesture of protection – my little sister was behind me – as I realized my mother was lying in bed, dead. In that moment a powerful force hit my stomach, chest and throat, and my back muscles locked up. I felt hit so hard, it was almost like being cleaved in two. And I knew that my mother was not in that room. I didn’t know where she went, but I knew she wasn’t there. We learned later that she died in the night of heart failure. She was 67 years old. My heart failed too, in a way. It felt as though Mother’s love had been suddenly turned off – dammed up, parching the river. I felt joyless, afraid of being “alone” on the planet without her. And her death ushered in a devastating period of loss. My fiancé left me (with an expensive wedding dress hanging in the closet). In December of 2003, my Father was diagnosed with cancer; he died three months later. As this river of loss swept through my life, I rarely went out, saw few friends, cried myself to sleep most nights. In despair, I wondered why these misfortunes had happened to me – what had I done to deserve this series of blows? And I wondered if I would be able to live through them. 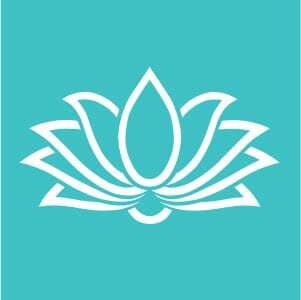 To help get me out of the depression, I threw my faith into yoga. I had been going to yoga classes, on and off, and intuitively realized the healing and transformative power of this ancient art and science. I made a decision: no matter how I felt or what happened, I would go to class three times per week. After a while, I started to feel better. I still couldn’t do downward dog – there was too much tension around my broken heart – but I was starting to move and breathe again. It was like early spring. The melting ice in my veins turned to water and began to flow, giving me the energy and courage to enroll in a yoga teacher’s training program. One of the teachers had recently returned from two years of yoga study in India. His teachings carried the elixir of India, which ignited in me a compulsion to live one of my dreams and go to India. I put my things in storage, gave away my apartment, left my cat with a friend and went to India for six months. 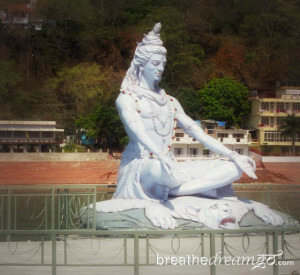 Near the end of my trip, a friend in Delhi suggested I go to the Aurovalley Yoga Ashram near Rishikesh. 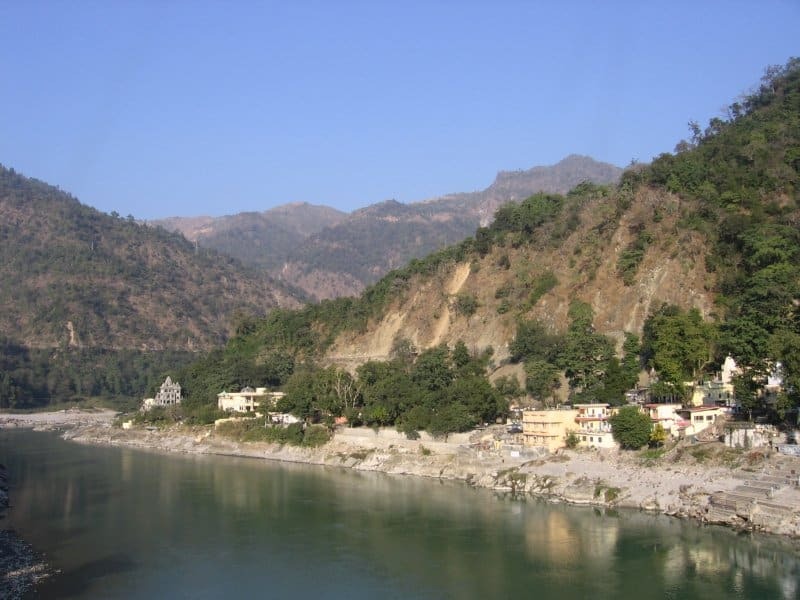 At the peaceful garden ashram near the Ganga, I meditated daily, walked by the river and listened to the teachings of the founder, Swami Brahmdev, under a mango tree on the ashram grounds. This reflective time was heaven sent. 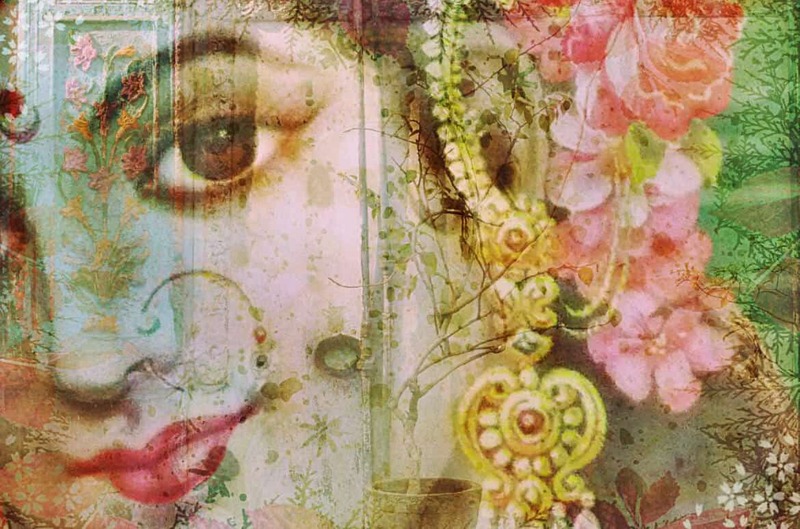 I realized that traveling in India had taught me how to surrender, relax, and go with the flow. It had reinvigorated my enthusiasm for life. 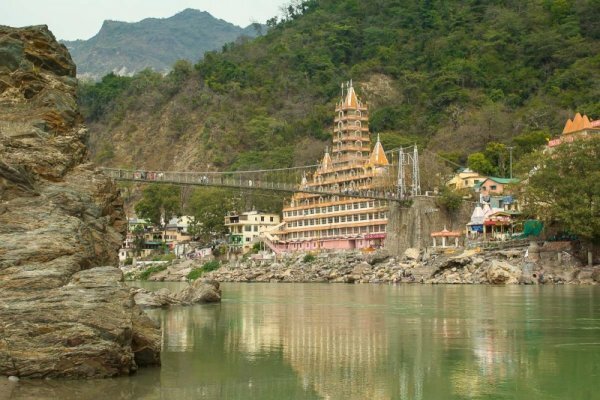 “All journeys have secret destinations of which the traveler is unaware,” said philosopher Martin Buber, and mine brought me one day into Rishikesh, and the evening aarti. As I lit the diya I thought of my mother. I poured into the little boat my love for her and my feelings of intractable loss. 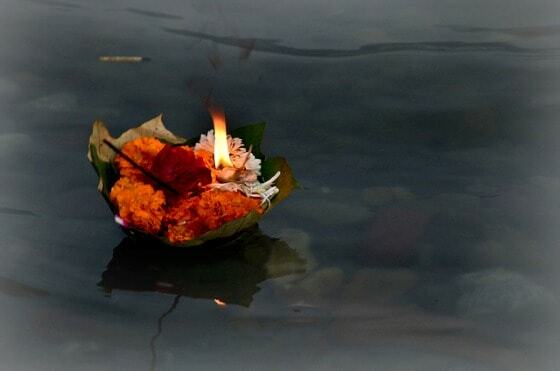 With tears in my eyes, I sent the diya out into the current, watching as it cleared the shoal and skimmed lightly along the glossy black surface of the Ganga, a tiny retreating light in the darkness, swept along by the currents of the mighty river. And as I watched, I allowed the magic of the ritual to transform me. 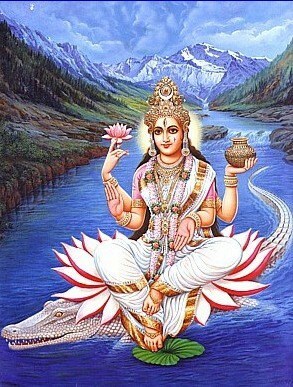 I thought of the millions of people, over thousands of years, who had stood by this long, life-giving river, invoking the mother’s love it symbolizes. I felt connected – to my mother, to mother earth, to the unending cycle of life, death and rebirth that runs through the lives of every creature on this planet. Like a river. A sense of calm washed over me as I realized that my mother and I are part of this natural cycle. Her sudden death was not a tragedy, not a cause for suffering or grief, not something terrible that “happened to me.” It was part of the natural pattern of life. I felt reminded of something I always knew, but forgot. I realized we are not apart after all, my mother and I. In that moment I felt the truth of eternity open up within me. I knew that beyond the apparent reality of everyday life, something much bigger than me runs through and unites all of life. Death is an illusion. I breathed in the primordial scene. I could feel the breath fill my lungs, and life course through me. I felt a complete sense of contentment and the warmth of quiet joy descend upon me, like the mist that drapes the distant foothills of the Himalayas. I felt love. During the rest of my time in India I gradually and gladly embraced this shift in perception and awareness. 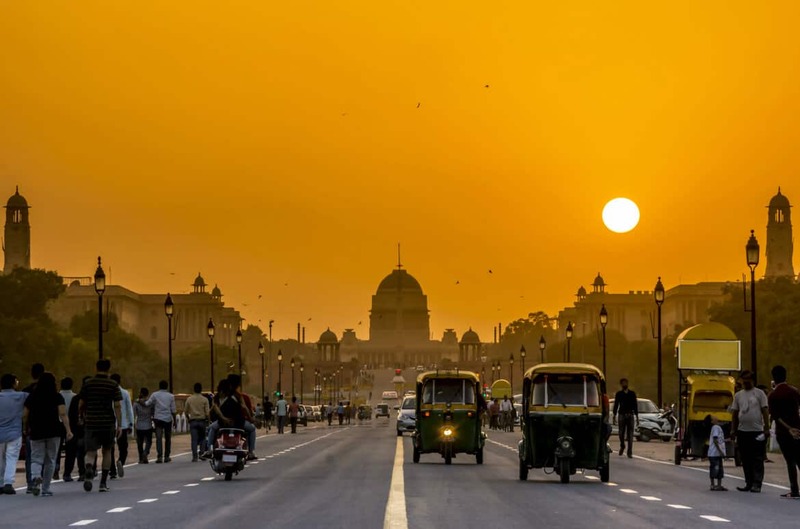 India’s gift to the world is an ancient and abiding wisdom built on the realization that reality is shaped in the mind and that the only lasting path to happiness is internal. From being the “worse thing that ever happened to me,” I saw my mother’s death as the catalyst for my spiritual growth and understanding. “Suffering is a gift,” Swami Bramhdev said. I understood.